When it comes to tending lawns and gardens, there are certain projects – tree removal being one of them – which are always best handled by experts. As long established and highly qualified specialists in every aspect of domestic and commercial arboriculture management, we handle all manner of tree removal projects – where trees have died and come to the end of their natural life, to clear sight lines around property, or to make way for larger scale development. Felling and removing trees of any height, age and state of decay – in part or whole – requires skill and sensitivity and our experienced staff will always work with the utmost care and consideration, clearing all overhanging branches, trunks and stumps from the site in question. 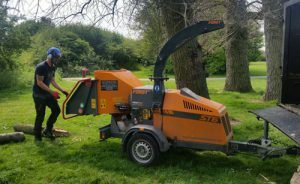 Working in Sevenoaks, Tunbridge Wells and extensively throughout Kent, East Sussex, Essex and Greater London, The Original Tree Surgeons are fully insured with both public liability and employee’s liability insurance of up to £5million apiece. If you have a tree removal issue and are a homeowner, private landlord, estate manager, or with responsibility for commercial properties, such as schools, colleges or hospitals – call us immediately. We will provide a free site assessment and full quotation ahead of any works. For all your tree removal requirements, large or small, contact us on 01892 599331. We’re sure we can help.